Enjoy the last hours when you can use a special coupon at Bath & Body Works stores in Canada. 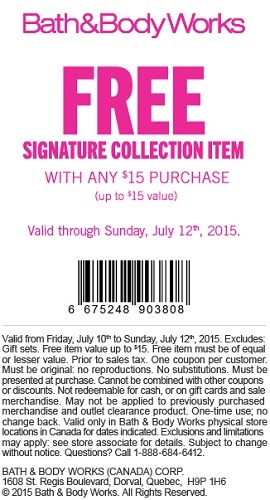 Get signature collection item for free when you spend at least $15. Hurry up, offer ends today (07/12/2015). Official source of the information is Bath & Body Works Canada. More information about this promotion at stores.